Just when you thought it was safe to return to the Maryland Ensemble Theatre (MET) for a weekly dose of free comedy at The Last Hurrah, the team returns for one last stab at a real horror show. 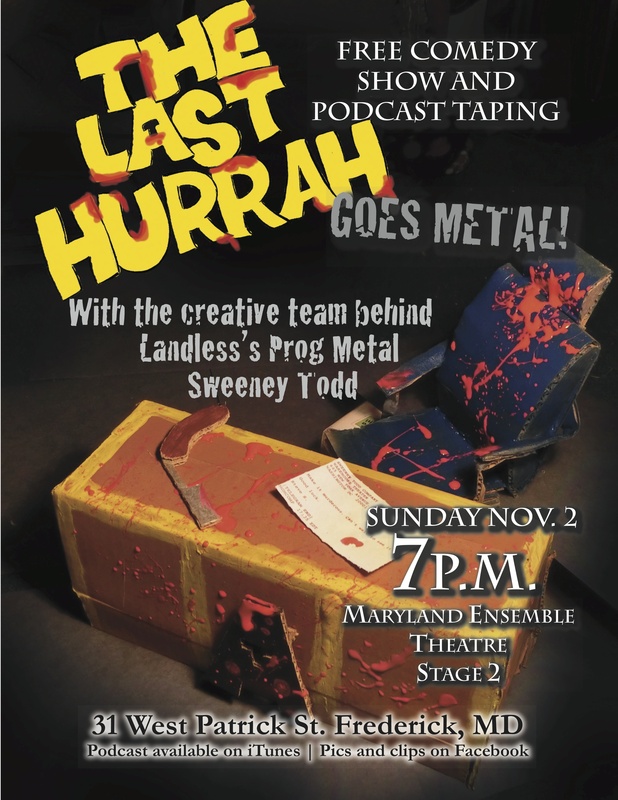 On Nov 2nd at 7pm The Last Hurrah goes metal as host Kevin Cole sits down with Landless Theatre’s Artistic Director and Sweeney Todd himself, Andrew Baughman, and the creative team behind their production A Prog Metal Sweeney Todd, Melissa Baughman (Director), and Ray Shaw (Bassist/arranger) to discuss what it takes to put a hard rock spin on a Sondheim classic. Join us Sunday, November 2nd, 7pm at the Maryland Ensemble Theatre (31 West Patrick St. Frederick, MD) for the best free way to end your weekend. You can click here to subscribe/review the show on iTunes.